Have you tasted Vietnamese Banh chung (or Chung Cake)? It’s our familiar food for every family in our traditional Tet festival, especially in the north. People living in the south of Vietnam also eat a similar cake called Banh Tet. 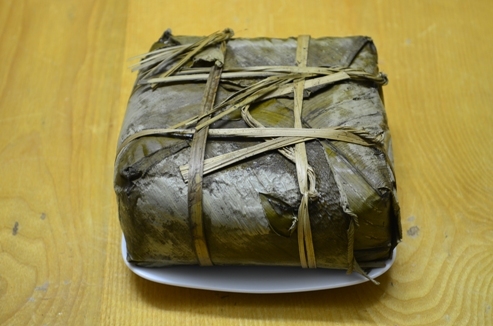 This Vietnamese rice cake is not square, but in a cylindrical shape. It has the same taste, and almost the same ingredients. In different regions, Vietnamese can eat Chung Cake barely, or together with some seasonings like sugar, fish sauce, or salt. Personally, I love to enjoy the rice cake with sugar; that’s my favorite in Tet holiday. Preparing ingredients together with the process of making and cooking Banh Chung brings the atmosphere of the Tet holiday. It takes about 12 hours to boil the cake, preferably with wood. This’s a meaningful opportunity for family members to get together and have intimate talk and show caring to one another. Adults sitting in front of the stove to watch the cook, while kids playing around the warm fire, all telling stories in the old year and good wishes in the coming new year. That’s an unforgettable memory for children to bring into their adulthood life. I still remember when I was a kid, my grandpa made Chung cake in the end of lunar years. Every time, he always remembered to spare a small cake with the remaining small ingredients. It was not as large and pretty as a normal cake, but it was a really precious gift to children like me at that time. I waited till midnight to have my cake. It tasted wonderful, and I’ll never forget such memory. Nowadays, specially in urban areas with nuclear families of only a few people, we don’t have time and habit to wrap Chung cake anymore. Instead, we buy a couple or two from stores. Many times, some of my relatives in countryside make the cake for their families and give me a couple as present. This modern habit is more convenient and suitable to urban living. But I and probably my children will miss the chance to live in a full atmosphere of a Vietnamese traditional Tet. In these days, we easily get all ingredient in a supermarket. But long time ago, farmer families have many components ready in their house and garden. I don’t wrap Chung cake in my family nowadays. But I know clearly what are needed to make it. For illustration, I found a good video clip by Helen on Youtube in case you want to learn how to make Banh Chung. Legendarily, Banh Chung originates from a story about Lang Lieu, the 18th prince of Hung King The Sixth. When the king got old and wanted to pass on the throne, he thought of holding a competition to find the most deserved successor for the kingdom. He told to his princes that each of them had to find out and make a unique food, whoever had the best dish would win the throne. In the competition day, the princes brought all specialties from everywhere, the highest mountains to the deepest oceans. All were delicacies. Yet, having tasted all, the King was impressed and chosen the most simple and meaningful dishes prepared by Lang Lieu. Those are Banh Chung and Banh Day, symbolizing the god and the earth respectively. Why did the king select such a food? It was the meaning of the cuisine. Inside the cake was the most precious pearls to agricultural living: sticky rice. The filling inside wrapped by green leaves denoted the love and protection of parents to children. Since then, Lang Lieu became Hung King the 7th. Chung cake was also the most popular food in any special occasion in Vietnam, especially during Tet festival and in the memorial day of Hung King (10th March in Lunar Calendar). This legend about Lang Lieu prince and Banh Chung, Banh Day is taught in elementary schools. It’s so impressive that I can still remember clearly today. Delicious cake, with notable legend! Have you ever tasted Vietnamese Chung Cake? You like it? You may want to share some of your thoughts here.